This year’s annual exhibition of the Klosterneuburg Monastery “The Emperor’s New Saint – Maximilian I and Margrave Leopold III in Times of Media Change” honours the Emperor 500 years after his death by offering an insight into his life and communication politics as well as into his relationship with Leopold III, founder of the Monastery. What is new is that an app developed by the Institute of Creative\Media/Technologies of the St. Pölten University of Applied Sciences makes it possible for visitors to experience life as it was during Maximilian’s reign. 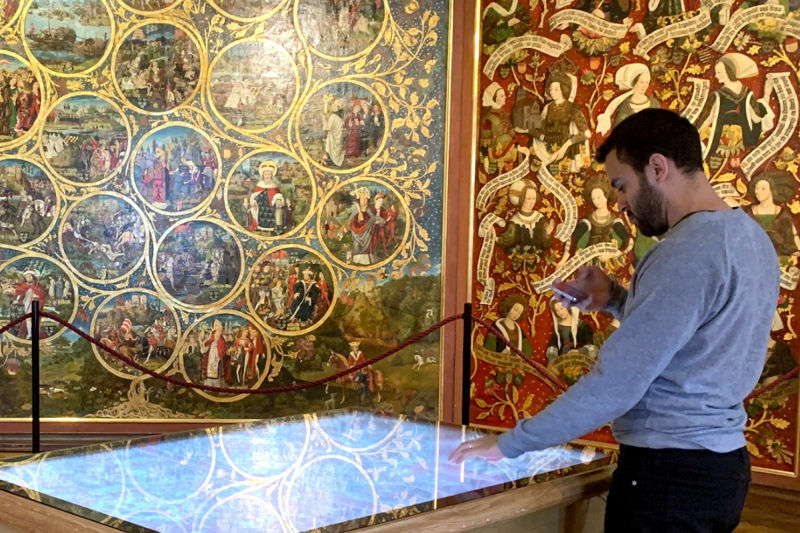 Digital stations designed by the St. Pölten UAS enable visitors to experience the creation of legends, the life of Maximilian I and the Babenberg family tree close up. 2019 marks the 500th anniversary of Emperor Maximilian’s death (1459-1519), which is why the Klosterneuburg Monastery dedicates this year’s annual exhibition to the monarch who ruled from the late Middle Ages to the Early Modern Period. Maximilian’s life was characterised by great upheavals: the invention of letterpress printing, the arrival of the first Europeans on the American continent and the beginning of the Reformation changed the world. The monarch also mastered the art of political communication and commissioned autobiographic books which praise his actions in narrative form with images and text. “The Emperor’s App” designed especially for the exhibition lets visitors slip into the role of a person who lived in the times of Maximilian I. Three different narrative threads within the app offer different perspectives on historical events and demonstrate that the past is always in the eye of the beholder. “The app, which can be activated via Bluetooth, guides you through the exhibition. If you approach an exhibition object, information about the object appears in a chronology (similar to newspaper articles) but with interactive elements”, explains Markus Seidl, Head of the Institute for Creative\Media/Technologies of the St. Pölten UAS. Markus Seidl and his team developed the app for the exhibition in collaboration with the monastery. In the „Weyßkunig Quiz“ (White King Quiz), the Emperor himself asks the visitors questions about the exhibition objects and historic events. The more answers you get right, the more likely it is that you will be granted an audience with Maximilian I. A panel painting which shows the Babenberg family tree and was commissioned by Maximilian I between 1489 and 1492 is also on display in the monastery. 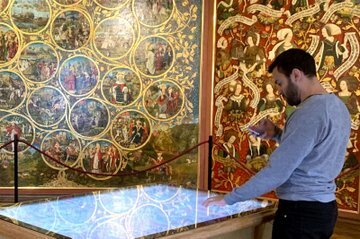 A multi-touch tabletop computer is installed in front of the huge painting which is otherwise hard to grasp due to its size of 8x4 metres. Thanks to this device, visitors can zoom in on the painting and get additional information concerning its details. The digital presentations regarding the exhibition were created within the framework of the research project MEETeUX (Multi-Device Ecologies towards Elaborate User Experience) of the St. Pölten UAS. The project investigates and designs different approaches for the use of digital technologies in museums to promote exciting and interactive exhibition experiences. “The knowledge resulting from these research projects is important in applying these technologies in a low-threshold manner and making them available to everyone. This is why the main focus of the project is on research regarding the interactive design and experience for visitors at the interface between man and machine”, explains UAS lecturer Kerstin Blumenstein who helped plan and design the exhibition and is currently working on her dissertation on digital presentations of museum objects. “Tried and tested concepts for the interaction and user experience design are still lacking for the use of smartphones, tablets and touchscreens or modern media technology in semi-public areas such as museums and exhibitions”, says project leader Markus Seidl. The aim of the project, which lasts until mid-2020, is the drafting of guidelines for the design of digital artefacts in the exhibition context as well as the development of the necessary software infrastructure. The exhibition at the monastery of Klosterneuburg serves as a “test run”. The functionality and user experience of the digital exhibition elements will be evaluated over the course of the next months. The current annual exhibition therefore offers visitors an idea of what a museum visit will be like in the future. The project is funded by the Austrian Research Promotion Agency (FFG) within the funding line COIN launched by the Federal Ministry of Digital and Economic Affairs and the Federal Ministry of Transport, Innovation and Technology. Project partners of the MEETeUX project are more than ten museums and providers of museum installations.